An ultra fast meteor came in from space and hit our atmosphere earlier this month at an incredible speed of 29000 miles per hour (46,600 km/h), says the American space agency NASA, which estimated the object weighed at least 150 pounds (68 kg) and was approximately 16 inches (40.6 cm) in diameter. NASA scientists believe it was a piece of an asteroid. 29000 miles per hour is equivalent to 8 miles per second. According to NASA, all its six sky meteor cameras in the Southeast of the US detected a meteor fifty miles above the Earth’s surface over the town of Georgia, about 140 miles southeast of Atlanta. NASA scientists were able to calculate the meteor’s weight and dimensions by measuring its brightness. When it hit the atmosphere it had been travelling due south at a speed of 29,000 miles per hour. The NASA cameras continued tracking it to an altitude of 17 miles above Locust Grove, a city in Henry County, Georgia, where it had slowed to 9,000 miles per hour. By this time the meteor was no longer producing light. NASA scientists say some fragments of this meteor may have survived and reached the ground as meteorites. We call it a meteor when it is flying, but as soon as it hits the ground it is called a meteorite. NASA says its scientists will be carrying out a more detailed analysis. In a separate alert of sightings, the American Meteor Society (AMS) received over fifty-five reports of a bright object whizzing across the skies of California, Arizona and Nevada on Tuesday, 22nd December, at around 18:10 PST. 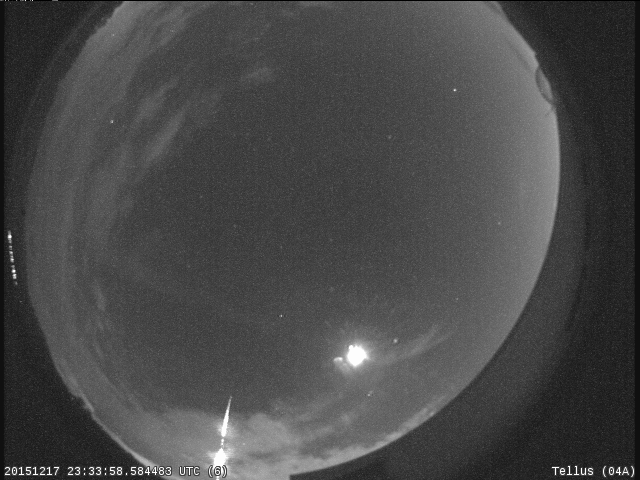 According to AMS, this was not a fireball. It was Russian space debris – parts from an SL-4 rocket body that had reentered the atmosphere somewhere above Arizona. The American Meteor Society says a fireball is a bright meteor, usually brighter than magnitude -4, which is approximately the same magnitude of the planet Venus as seen in the evening or morning sky. A fireball that explodes in a bright terminal flash at the end, sometimes with visible fragmentation, is called a bollide. Reporting a fireball in the United States. Reporting a fireball in the United Kingdom.